We believe that children need to experience duties and responsibilities that come with being a member of a community. We believe that prefects have a very important role to play in the day to day organisation of our school and as only Primary 7 pupils are allowed to apply for this position, it is considered to be very prestigious. The position not only allows the Primary 7 pupils to lead by example and demonstrate their responsibility, it also enables the younger children to learn from a good example. The Prefects in Rosemount Primary and Nursery School must lead by example at all times in their behaviour, the respect they show to others and their school uniform. 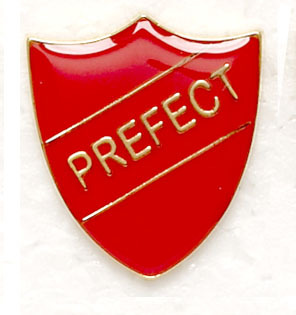 A prefect’s role is varied and to be awarded a school prefect badge is considered to be a real privilege. TEAM A are currently on duty.